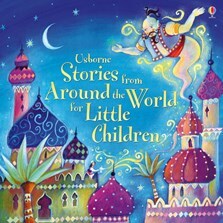 A fantastic treasury of stories from around the world specially retold for young children. Includes the traditional tales of ‘Aladdin and his Magical Lamp’ (Persia), ‘Brer Rabbit Down the Well’ (United States), ‘How Zebras Got their Stripes’ (Africa), ‘Why the Sea is Salty’ (Korea) and ‘The Dragon Painter’ (China). Each story is beautifully illustrated and perfect for either reading aloud or for more confident readers to tackle alone.